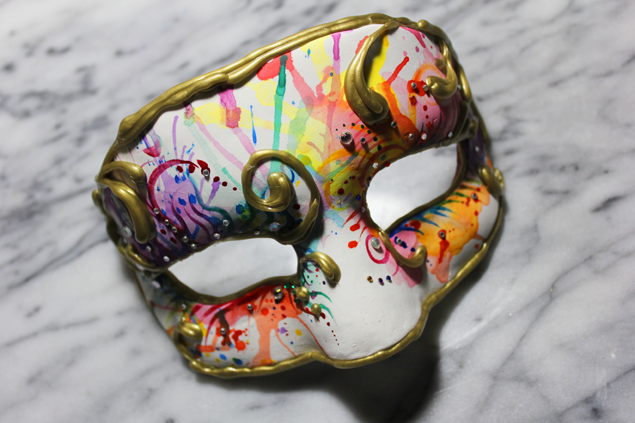 This week’s masquerade mask is a little more colourful than last weeks. When I asked you guys on Twitter which of my mask suggestions you preferred, the watercolour mask won by a fair majority, closely followed by a galaxy themed mask – which I’ll be doing soon. This mask though is really really easy to make. If you’re not confident enough to do the glue gun swirls you can leave those out. It’ll look just fine with just the rhinestones and watercolour splatters.